It’s 22nd May, approximately 4.30 pm and it’s raining heavily in Nairobi, Kenya. For reasons, un-known to me, I am particularly calm taking into consideration that it is a Friday evening and its raining cats and dogs. For those who are well versed with this city one knows that when it rains, traffic comes to a standstill. And I mean stand still, no movement no nothing; you might as well switch off the car and wait for 3-4 hours to move an inch. To paint a clearer picture for those not familiar with the area; barely a week prior, a former school mate had posted on Facebook how she had left her office at 5pm only to arrive home at 5 am the next morning in time for a hot shower, breakfast and head back to the office. She wasn’t the only one. My timeline for the rest of the week was telling of such like catastrophic incidences. One may wonder why this is the case. I think this is partly due to the poor drainage coupled with torrential rainfall and poor visibility on the roads. This blog post is to share about my experience on a boda-boda in the rain and elucidate on why I would do such a thing. I was headed to the airport to catch a flight to Johannesburg for a youth engagement strategy workshop which I will talk on a little later on. Seated in the car with my brother who had offered to drop me, we begin to calculate the fastest route. To make it to the airport in time, we had 3 options and settled on one which proved to be the worst; a new road in Upperhill. Nonetheless, my flight was for 9.30 pm so I was still a bit calm, little did I know that the worst was yet to come. As we approached the road, I could spot 5 or so cars whose engines were switched off; this was a sure sign of what to expect. I asked my brother to turn around but he reminded me of the traffic we had witnessed on the other side as we drove past. “This should be interesting,” I muttered. Just as I shifted in my seat to try and get comfortable, a cousin called me and inquired on where I was. It’s like she knew. “I really hope you make your flight considering how difficult this trip has been.” To take you back a little further, I had already missed this very flight two days prior. This was my second attempt. But that is a discussion for another day. It’s 6.30 pm and we’d barely moved. Meanwhile, my colleagues in Johannesburg who I was meant to be joining for the workshop were frantic. Honestly if it were not for their continuous encouragement and concern I would have long gone given up on this trip and called it fate, destiny if you may. George, Rotimi and Ruth, thank you. I then go to the boot of the car and begin removing things from my suitcase as my brother looks on waiting for an explanation. He sees me put on a shower cap and jacket. He had read my mind. “Let me call that boda guy,” he says. It’s 6.45 pm and I know that I have to be at the airport in 45 minutes. First, because I needed to sort out the mess that was missing my previous flight and secondly, for obvious reasons I just did not want to miss this flight. The boda guy whose name is Philip was very encouraging. “Philip hii ni mara yangu ya kwanza kwa boda tafadhali enda pole pole lakini nahitaji kuwa airport 7.30.” (Philip this is my first time on a boda please go slow though I need to be at the airport by 7.30) “Such a tall order, poor guy,” I thought. I bid my brother good bye and off we went. If my brother was at all worried at that point he deserves an Oscar for the calm and confidence he exuded; there was no sign of worry or strain in his voice and face. It’s only he’s frantic calls in 30 minutes that gave him away. Bless him. Philip then guides me on where/how to place my suitcase and where to place my feet as he hands me the helmet. I whispered a short prayer loud enough for Philip to hear and we both said amen in unison. We were well on our way to the airport in the rain. Now, if I had decided to brave the traffic there’s no way I would have made it, not even by midnight. The roads were in disarray with cars overlapping left, right and centre. My gestimate (guess-estimate) is that people arrived at their respective destinations past 2-3 am. I had periods of oscillating faith, periods of doubt when I quietly pondered my fate with the wet tarmac as Philip zoomed past. He tried to ease my tension by talking about his life as a boda driver. In fact he mused with pride, “I go home every fortnight on this boda, it takes me 4 hours.” I could tell that I was constraining his breathing and flow from how he kept shifting in his seat as he talked. I was clutching on way too tight and had lean in way too hard but Philip said nothing, my comfort was key. It only hit me on Mombasa road. By this time the rain had subsided somewhat and I could feel my clothes drying out. We arrived at the airport in 10 minutes. I was in utter disbelief. The policeman at the airport was in utter disbelief too. “Madam umeshinda leo,” (Madam you have won today) he said as he hailed a cab for me. I thanked Philip profusely for the ride as I paid him his dues and we bid our good byes. 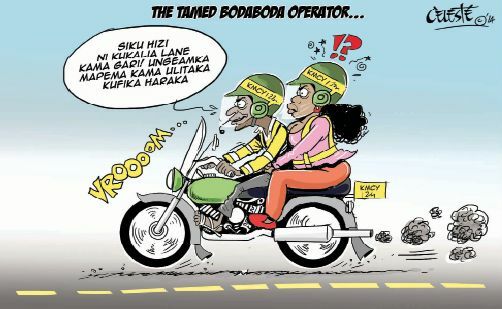 I definitely will be calling him for the next exhilarating boda-boda ride. My colleague and friend Ibraheem came to receive me at O.R Tambo looking more beat than I. It was then that it dawned on me the high adrenaline levels still pumping through my system 4 hours later! But why was this trip so important to begin with? About a year ago, I met a group of forward looking individuals within the African Union Commission, particularly the African Governance Architecture secretariat which is within the Department of Political Affairs(DPA). These individuals have made it their paramount goal and objective to ensure that youth regardless of their education, professional background or affiliation pervade all spaces within this regional body. Here was an opportunity to learn and brainstorm with them on how to push the buttons a little more, take it a notch higher in ensuring youth take ownership of this institution that is essentially here to serve them. I will be sharing more on these engagement spaces in due course. “Every generation must recognize and embrace the task it is peculiarly designed by history and by providence to perform,” Chinua Achebe.